Greetings again from the darkness. Hot societal topics often become fodder for new movies, and this usually results in a slew of similar stories – some good, others not so good. Currently, discussions of gender identity is second only to Trump-bashing in terms of media attention, and so we can expect Hollywood to rush-to-production in order to capitalize. This latest from director Silas Howard had a timing advantage as it was adapted by writer Daniel Pearle from his own play. The titular Jake is a 4 year old (his 5th birthday party plays a role) who enjoys fairy tales and dressing like a princess. 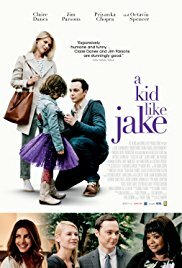 His stay-at-home mom (Claire Danes as Alex Wheeler) and psychologist father (Jim Parsons as Greg Wheeler) are aware of Jake’s preferences, but as with most things in their marriage, what minimal conversation occurs is of the over-the-top arguing type. The “issue” is painfully and awkwardly brought to the forefront as the parenting couple subject themselves to the Private Pre-School application process. The challenges of parenthood, including judgmental friends and relatives, and the competitive nature of comparisons, are beyond obvious in most every scene of Act 1. Even Alex’s (probably not coincidental that her name is gender-neutral) mother (Ann Dowd) is passive-aggressive in her judgments of Alex quitting her job as a lawyer to stay home with her son. Octavia Spencer co-stars as Jake’s teacher and counselor to the Wheelers during the application process, and even her role has a twist designed to elicit more judgment and discrimination. There is really nothing convincing throughout the film. It’s barely Lifetime Channel material, with a simplified emphasis on the difficulties of raising a non-conforming child. The incessant arguing amongst parents, family members, and friends makes each successive scene more annoying than the previous. The film should have been entitled “Parents Like Jake’s” because Jake has almost no screen time, while Ms. Danes flashes her “Carrie cry-face” (for “Homeland” fans) incessantly. Certainly the topic of gender identity and non-conformity is worthy of discussion and analysis, as it has entered mainstream conscience in less than one generation. Anxiety and confusion exists, and even well-meaning conversation can take a wrong turn quickly. We just need – and deserve – better guidance than this film provides. This entry was posted on Thursday, May 31st, 2018 at 9:57 pm and is filed under Drama. You can follow any responses to this entry through the RSS 2.0 feed. You can leave a response, or trackback from your own site.